Performers include: JD Pardo, Clayton Cardenas, Edward James Olmos, Sarah Bolger, Michael Irby, Carla Baratta, Antonio Jaramillo, Raoul Max Trujillo, Richard Cabral Danny Pino, Emilio Rivera, Frankie Loyal, Joseph Lucero, Vincent Rocco Vargas, Maurice Compte, Gino Vento, Tony Plana, and Ada Maris. From co-creators Kurt Sutter and Elgin James, the Mayans MC TV show is a spin-off of Sons of Anarchy. 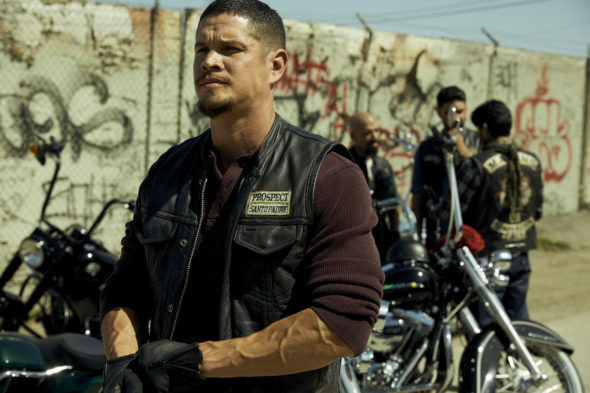 The drama unfolds after the death of Jax Teller (Charlie Hunnam) and centers on Ezekiel “EZ” Reyes (Pardo). Newly released from prison, EZ is a prospect in the Mayans Motorcycle Club (i.e. Mayans MC) charter on the California–Mexico border. Once a golden boy with a bright future, now EZ has to start all over and establish a life for himself. EZ’s brother, Angel (Cardenas), is already a full-patch member of the Santo Padre charter of Mayans MC. That their Mexican family never had such high hopes for Angel weighs on him. As a result, he’s stingy with his love and even tighter with his trust. Their father, Filipe (Olmos), has been ground down by a life of hard labor and gun violence. He longs for his sons to follow the road to righteousness and prays his own dark past will never come to light. The club’s Santo Padre charter is led by President Obispo ‘Bishop’ Losa (Irby), whose ruthless cousin, Marcus Alvarez (Rivera), founded the club and serves as National President. Serving alongside Bishop, in Santo Padre, are Vice President Che ‘Taza’ Romero (Trujillo) and El Secretario Michael ‘Riz’ Ariza (Jaramillo). Rounding out the cast of characters are former Army sharpshooter and weapons specialist Johnny ‘Coco’ Cruz (Cabral), a full member, Miguel Galindo (Pino), the Ivy League-educated son of the founder of the Galindo cartel, and Alelita (Baratta), whose family died at the cartel’s hand. Determined to exact an “eye for an eye,” Adelita mentors other Mexican orphans. The son of a dignified family, EZ was poised to live out the American dream, until border violence changed everything. These days, he is fueled by the desire for vengeance and racing toward a life he will never be able to escape. Meanwhile, his childhood sweetheart, Emily Thomas (Bolger), has traded in her old ways for a life of luxury. What do you think? Do you like the Mayans MC TV series? Should this FX TV show be cancelled or renewed for another season? Love the show. Please bring it back!!! OMG !!! I can’t believe it’s even a question to renew or not!!! I’ve been waiting for it to come back on, & Then I see THIS !!!! YES !!!! Renew It !!! !